The basic-level line of automatic fuel recirculating systems cleans and circulates stored fuel on a preprogrammed schedule. It is PLC controlled with a key switch and 24-hour, seven-day programmable clock. The system consists of a fuel purifier, continuous-duty motor, and a fuel pump. 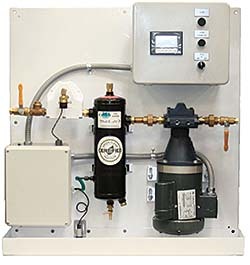 The system has one general alarm relay contact that is triggered by one of four alarms — pump failure, purifier high-water level, system high pressure, or fuel catch-basin leak. The open-face unit can be wall-mounted or placed in an optional cabinet enclosure for ground mounting. The line is available in flow rates of 5, 11 or 25 gallons per minute.